We’ll start off with a bang and show application performance, along with media encoding performance comparing Intel’s QuickSync technology with CUDA video encoding. We’ve got a variety of laptops and notebooks in our charts for comparison, including dual-core and quad-core AMD (not their fastest mobile chips, unfortunately), plenty of Arrandale options, and a few Clarksfield notebooks as well. 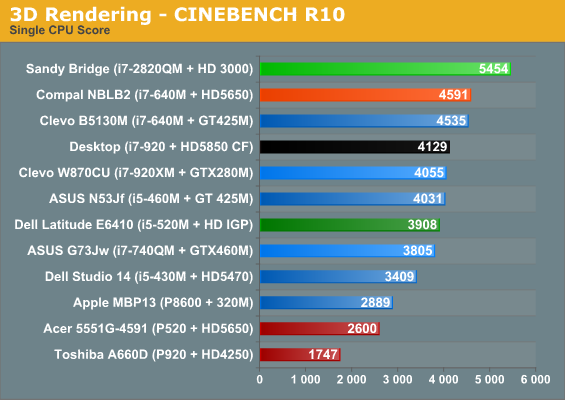 And just for good measure, we’ve included results from a desktop Core i7-920 as a point of comparison. 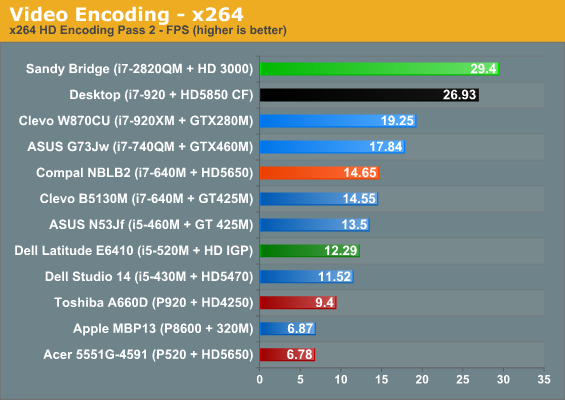 Normally that would be raining on Intel’s parade by showing how previous generation desktop hardware is still quite a bit faster; this time, however… well, I’ll let the charts tell the story. So, is anyone as impressed as I am? 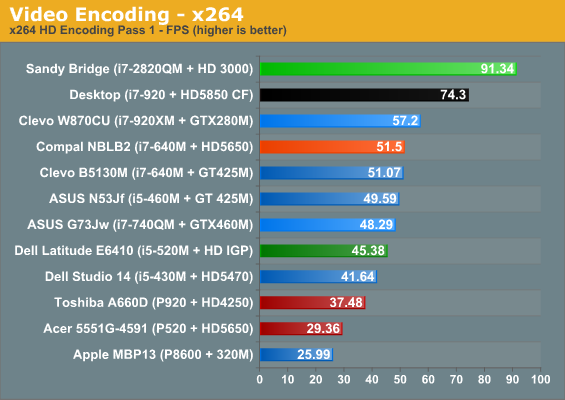 Sure, hex-core Gulftown is still the fastest game in town, and the desktop Sandy Bridge chips are obviously going to beat the mobile chips, but check out the scores relative to the i7-920 in my own “for play” system. (Incidentally, my “for work” system is actually running QX6700 still, and it does even worse! But all I do there is type documents and surf the web.) Let’s talk percentages here just to put it all into perspective. 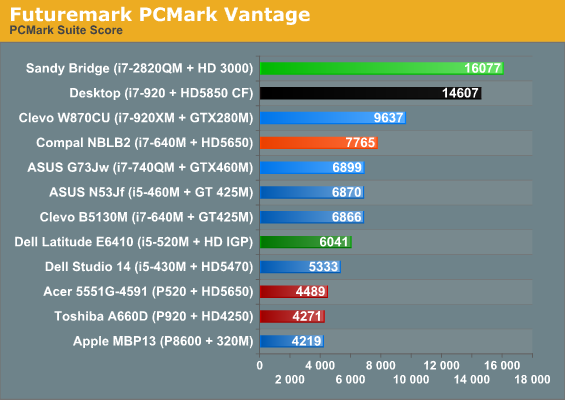 Since PCMark Vantage and 05 are susceptible to heavy SSD influence, we’ll just skip those scores; suffice it to say that Sandy Bridge is no slouch there. 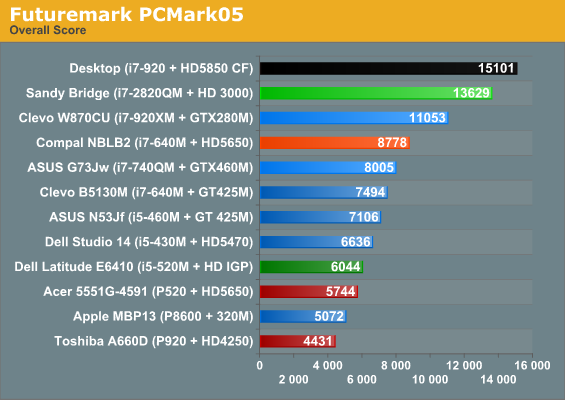 Turn to CPU-intensive benchmarks, however, and we can really see the changes. 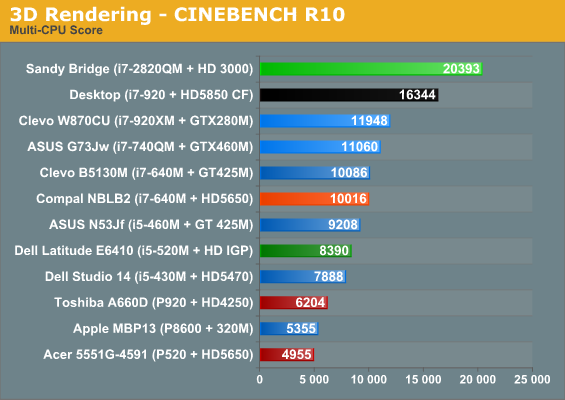 Starting with single-threaded Cinebench, the new i7-2820QM checks in 35% faster than the outgoing i7-920XM, 32% faster than a desktop i7-920, 43% faster than the i7-740QM, and 19% faster than the previous generation’s fastest dual-core part. AMD is toast. Those are blistering performance numbers that even I did not expect. Incredible that it manages near 30 fps in several games at medium detail settings. Bah, AMD has been toast for years now, if they really were, they would be buttered and eaten already. I'm a tech enthusiast especially in the portable device scene, and I always nit-pick things. Which is the reason why I own the Acer 4810TG. The Core i7 640-UM would be my favourite processor, until I saw this. The successor, 2657M, seems to have (theoretical) performance improvement of 19% and battery saving of 6%, which is very amazing. From pure guestimation, this is ~200% (or slightly more) performance of the SU7300 at the same battery life. Whoa! This would mean new ultra-portable devices (less than 14" and over 6 hours battery life). BUT, I wish they could add another chip on that (ULV) list. I mean, how about real 10 hours battery life (6 cell) on something about as fast as the SU7300 ?? I'd prefer a dualcore with 1ghz, or even 800mhz. as it could still clock to 2ghz or so, it would be fast when needed, but very battery saving else. if intel would go down further, it would most likely by now kill atom in the netbook and tablet area. and in the phone area, atom isn't there yet.